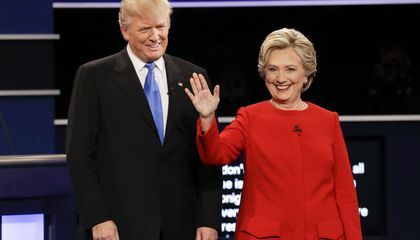 From mock elections to writing projects and Electoral College math, teachers are embracing the presidential race between Donald Trump and Hillary Clinton. They see it as a real-world teaching tool. Muslims. Taxes. The wall. Emails. The negative exchanges. They're all up for discussion in Halie Miller's fourth-grade class at Glacier Ridge Elementary. It is in Dublin, Ohio. When the students hold their own debates, they're polite and respectful. The election provides material for other subjects beyond social studies. In math, Miller's students have learned about the magic of the number 270. They use addition and subtraction to come up with different combinations to get to 270 electoral votes to claim victory. "Educating students about their role in a democracy was one of the original goals of public education in this country. And it should remain so today, as our nation becomes more and more diverse," Education Secretary John B. King Jr. said in recent remarks at the National Press Club. This election no doubt has presented challenges for educators. The campaign includes difficult topics. And it has a lot of general bitterness and angry rhetoric. It's also opened the door, though, to some good debates. "They're having discussions about race. They're having discussions about religious freedom," she said. "They're having discussions about should girls aspire to be president as likely as a boy would aspire to be president." Alice Reilly is president of the National Social Studies Supervisors Association. She says teachers can't ignore the election. Teachers Sara Winter and Patricia Carlson at Williamsburg Middle School in Arlington, Virginia, turned the election into a five-week THINK-TAC-TOE project for their sixth graders. They are required to complete three of nine activity squares on their worksheets. "You can get bogged down by the negativity. But to see kids excited about the election and kids feeling they have a voice, it gives me a boost," Stites said. "Any time kids in your classroom are engaged and don't want to leave class, that's a good feeling." Stites is a teacher at the Bryant-Webster Dual Language School. He says immigration is the issue his seventh- and eighth-grade students have the most questions about. The school has a diverse population. Some kids, he says, have asked him, "Mr. Stites, if Trump is elected, what does that mean for us? And, how much power does a president really have?" There are questions about Clinton, too. Stites says his students have discussed her emails. They discuss whether they think she's good at securing classified information. Miller says one student asked what a Muslim was, and why Trump wanted a temporary ban on Muslims entering the country. 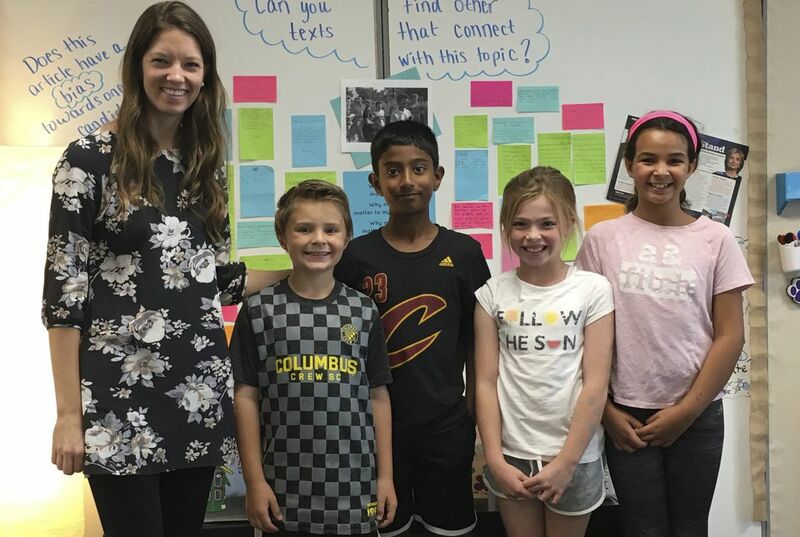 So, Miller turned to the children's book "Golden Domes and Silver Lanterns: A Muslim Book of Colors," to discuss Muslim culture with her class. Another child said the Islamic State group and the Sept. 11, 2001, attacks had something to do with the ban. The students then discussed whether they thought that was fair. Mock elections, class project, debates, and useful information about elections and candidates are extremely important. Politics is usually a topic that family and young students lack a knowledge or care about. This article is extremely important because it shows how young students are exposed to the truths of politics so that they can have a relevant opinion. The more mock elections and classes about politics and elections around the country will eventually help our country economically and politically. I agree with you that people like teachers are using the elections are very important.The article are important that anyone in the world can vote[that is 18 or older] and the teachers can help the students have something fun to learn about so they can learn about who is going to be there new president. I think its interesting its on a Tuesday. I mean I disagree wit some of da reasons, and agree wit most of dim. In response to "Teachers use election to spark student debate ," I agree that we should do this more often because it gives them a taste of the real thing that's going on. One reason I agree is that kids should debate in the classroom is they like to keep it calm and share there opinions. Another reason is that Teachers can assign homework that is fun and interactive with the community . A third reason is they can share there option freely without judgement in the classroom . Even though it could start fights I think it would still be a good idea to have debates in the classroom. In math, Miller's students have learned about the magic of the number 270. "Teachers all over the country are having some very hard conversations with their students in a nonpartisan way," says National Education Association President Lily Eskelsen Garc°a. Take a 30-minute walk around the neighborhood, tally Clinton and Trump yard signs and write two to three paragraphs about why the student thinks people in the community might support one candidate over the other. Back in Miller's class outside Columbus, students read about the campaign in Scholastic News. Miller says one student asked what a Muslim was, and why Trump wanted a temporary ban on Muslims entering the country. I think that doing mock elections at a young age is good so then children and young teens know how important voting is and that they can get in somewhat of a habit. Also, being able to debate about the election and different topics about the election is great for the students. I think that debating about the election is an awesome idea. In response to "Teachers use election to spark the kids." I agree that teachers should do this they can become more involved in stuff that will affect their lives. One reason I agree is that The students will start liking the election. Another reason is that the students will become more involved in politics. It says in the article that students will have more knowledge about the people running for president. I really like the idea of mock elections for schools. We can't vote because we're under age but I really like that schools let kids have a voice as said In the article. I think it's cool that teachers are taking the election past social studies to math. In the article it said that kids are putting there opinion and debating on things and i think that's important too.